The son of an excavation contractor, Timothy D. Boyd grew up in the St. Louis suburb of Valley Park. Playing golf, football, and basketball, Boyd graduated from Lindbergh High School with his future wife, Melissa "Missy" Kuelker. Ironically, despite his future in the industry, Boyd was not a skier. Boyd earned his Bachelor of Science degree in Education and Economics from University of Missouri-Columbia in 1975 while on a golf scholarship. Boyd reportedly purchased the struggling Hidden Valley golf course in Wildwood Missouri for $250,000 in 1977. The next year, while visiting his brother in the Lake Tahoe area, Boyd skied in the rain on the bunny slope at Homewood. Inspired by the crowds in less than stellar weather, Tim Boyd decided develop a ski area closer to home. 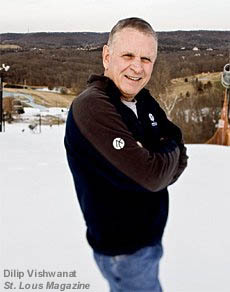 In 1982, Boyd, with the help of his father Glenn, his uncle, and the St. Louis County Industrial Development Authority, Boyd opened a small ski area at the golf course for $1.5 million. Two years later, he opened his second Missouri ski area, Snow Creek. On September 24, 1997, he incorporated Peak Resorts, Inc., rolling his existing recreation holdings into the new entity. Also in 1997, Paoli Peaks, IN, was added to the company. In 2002, after looking into other operating or abandoned New England ski areas (including Temple, NH), Peak Resorts purchased the defunct Crotched Mountain, NH ski area. In December 2002, Peak Resorts purchased Boston Mills, OH and Brandywine. The following December, newly rebuilt Crotched Mountain, NH reopened. On December 1, 2005, Peak Resorts agreed to a 28 year lease of Big Boulder, PA and Jack Frost, PA. In December 2005, Entertainment Properties Trust purchased Mad River Ski Resort, OH, with Peak Resorts obtaining a long term lease. On April 5, 2007, Peak Resorts, with financing from Entertainment Properties Trust, purchased Attitash, NH and Mt. Snow, VT from American Skiing Company. Mt. Snow became the largest ski area in the Peak's portfolio. On Ocotber 30, 2007, Peak Resorts entered into what would be a $41 million financing agreement with Entertainment Properties Trust, covering Jack Frost, PA, Big Boulder, PA, Paoli Peaks, IN, Boston Mills, OH, Brandywine, OH, Hidden Valley, MO, and Snow Creek, MO. On October 20, 2010, Peak Resorts acquired Wildcat, NH, thereafter marketing it with nearby Attitash. On April 18, 2011, Peak Resorts filed a Form S-1 with the U.S. Securities and Exchange Commission, a step toward a potential $40 million public stock offering. Tim Boyd is currently Chief Executive Officer and President of Peak Resorts. His son, Jesse, is Vice President of Resort Operations.